These words best describe the DM-43 sharpening system from Sterling Gun Drills. Designed as a compact, self-contained unit, it can easily be located next to work in progress, enabling operators to properly maintain gun drills and half round drills while remaining at their work stations. 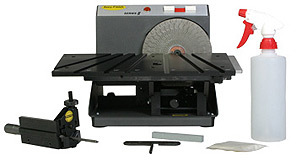 The DM-43 sharpening system services drills from .100" to .700" in diameter and comes complete with everything necessary to maintain and maximize tool life and efficient hole production. With the drill grinding table removed, a protractor table is revealed, allowing the resharpening of carbide inserts and lathe tools.